Washington Sep 15 (IANS) At least five people including an infant were killed in the US state of state of North Carolina as hurricane Florence made landfall authorities said. After coming ashore in North Carolina as a Category 1 hurricane Florence downgraded to a tropical storm on Friday afternoon and trudged into South Carolina later in the night reports CNN. The police force of Wilmington the largest population centre in the impact zone said via Twitter that a woman and her baby died after a tree fell on their home while the father was taken to a nearby hospital. Another person died in nearby Hampstead North Carolina reports Efe news. Tom Collins director of Pender County s Emergency Management said that a woman who suffered a heart attack died because an ambulance was unable to reach her in time due to fallen trees blocking the roads. Soon afterward the administration of North Carolina Governor Roy Cooper said that a 78-year-old man died of electrocution as he was attempting to connect a power generator while CBS 17 television reported that a 77-year-old man was killed after a gust of wind knocked him to the ground. Some areas have already received 15 inches of rain according to the National Hurricane Centre which warned that the storm could bring up to 40 inches of rain to parts of North and South Carolina producing "catastrophic flash flooding and prolonged significant river flooding"
A storm surge of about 10 ft above normal levels was reported by the National Weather Service s office in Morehead City North Carolina. 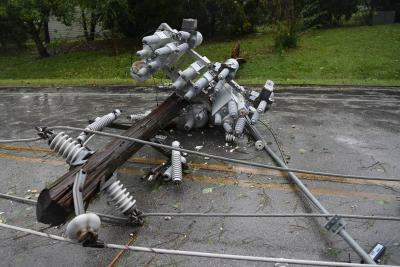 Duke Energy a utility company that serves the Carolinas estimated that up to 3 million customers could lose electricity as a result of the hurricane.